« A day out in the vineyards…. The mornings have been rather chilly on our holiday and there is nothing quite as nice as that first hot cup of tea. 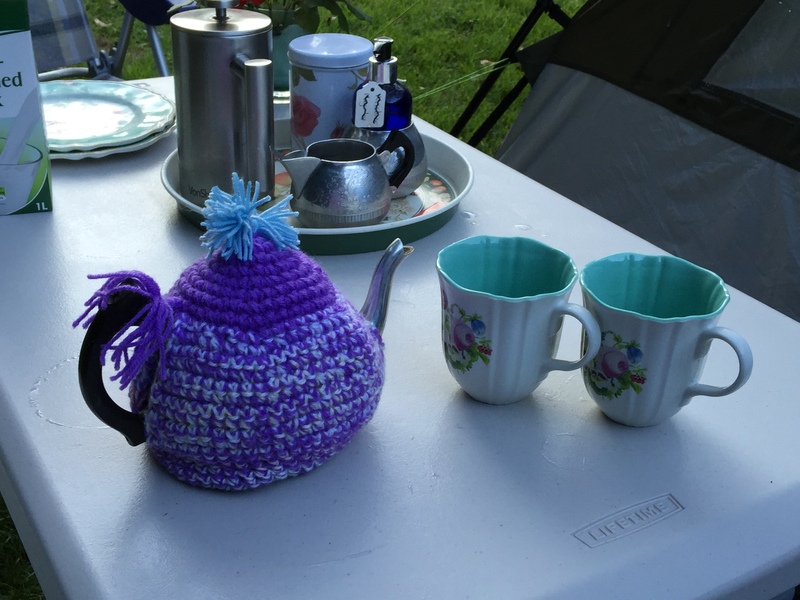 We have an adorable little pewter tea set in our camper van but it was missing a tea cosy to keep the tea lovely and warm while it brewed. Luckily I had brought a small bag of yarn and my trusty crochet hooks with me – mostly in the hope that I would come across some beautiful German wool to buy and turn into a blanket. The only yarn I had were a few odds and ends left over from various projects, and those would have to do. This particular purple was once created into a Minion hat for my granddaughters and it was doubled up with a few other bits to create a nice double, double yarn to ensure maximum warmth for the brewing process. A very worthwhile endeavour on a quiet camping night, and an hour later here it is…. …it most definitely not going to win the prettiest tea cosy prize, but it certainly does the job…and it will hold many fond memories of our trip to Germany. Haha! I think it’s very pretty and can’t believe you made it while you were there! We have to use what’s available sometimes 😄 wait until you see the ugly emergency mobile phone holder I made!